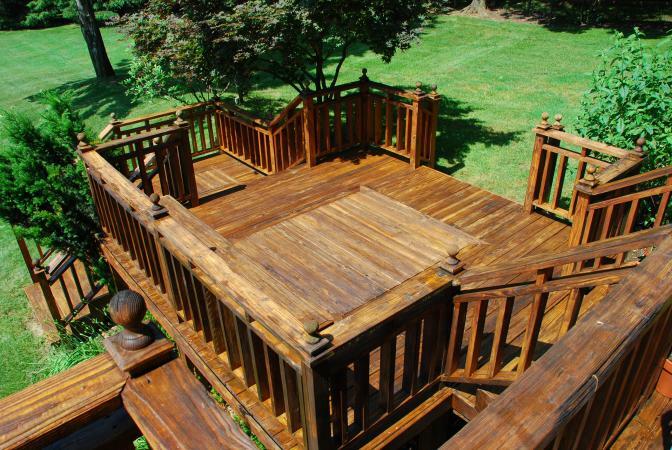 Dreaming of a deck won't get it built or guarantee it will work with your home and backyard. Create a deck and take your idea to a local contractor or lumberyard to finalize the design before building. Consult a professional before you proceed with any of the designs. All software below is for residential projects. Decks.com Free Deck Designer requires you sign up for an account before you start creating your deck. It's a basic software program, allowing you to put together shapes and sizes to make your ideal deck. You can check out top, front, and side views in 3D. The Layers tab allows you to change footing, decking, railing, and dimensions. At the end, you'll get building plans and a list of materials to complete your project; you can also search for builders in your area. Quite a few software programs are free because they are connected to a particular brand or retailer which encourages you to utilize their particular products. If you have a preferred brand or retailer, check their website to see if they offer this option, or visit one of the free tools below. All require you to create an account to use or save your deck designs. TimberTech offers free online design software that utilizes their AZEK decking products. After creating your free account, you'll be able to work with a template or start with a blank slate and select your decking, railings, lighting, and even position accessories in 3D. Start by selecting your style and shape, and continue with options for tiers, finishes, and more. The designer navigates easily and has a clean, modern interface that users will appreciate. Simpson Strong-Tie Deck Planner Software allows you to create a deck using both name brand and generic decking options in conjunction with Simpson Strong-Tie connections. You can adjust your deck's load, size, height, number of levels, railing, and can simulate the finished look with accessories. If you're interested in learning more about one of Simpson Strong Tie's products, you'll also have the option to click on connections to learn more while designing your deck. At the end of the design, you will get a list of materials for your project. The tool isn't quite as intuitive as others, but you'll get a well-designed deck when you finish. Fiberon Deck Design Tool allows you to do many of the same things as the previous software programs in a friendly format that's simple to use. Select your walls, shapes, materials, lighting, and other aspects like customized entryways. You'll also be able to select your decking colors and wood types - plus decide how you want the decking laid. The Lifestyle option not only offers typical options like kitchens, furniture, and landscaping, but also a choice to incorporate a spa into your deck plans. When finished, you'll get a materials list, cut list, diagrams, and tips. 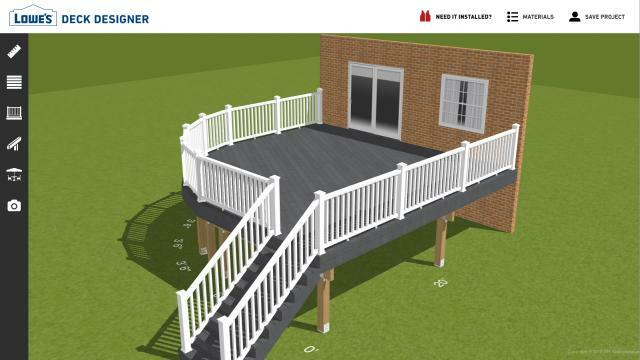 Lowe's Deck Designer Planner is a helpful decking tool that allows you to start from a pre-designed deck or from scratch. The pre-designed options allow you to modify them, saving you the time and trouble of making one yourself. This is ideal for someone who wants to quickly come up with a deck but not spend too much time customizing. The scratch option walks you through how to use the designer, allowing even novices to create one with ease. Unlike the other design software programs, Lowe's does not need you to create an account to get started, though you will if you want to save it. Lowe's offers the typical options for decking materials, railings, and so on, but at the end, the materials list will also give an "estimated price" for purchasing the items through them. Once you've designed your deck using one of the free programs, you're not guaranteed that it will look exactly as designed or work with your home. Take the design to a professional in order to get accurate materials and to check the design itself for any structural flaws. If you are not an experienced builder, you'll want to hire someone who is in order to build the deck properly.